After gloating about the decline in strikes to record levels in 2015, just months later, the right-wing Tory press is now frothing at the mouth as workers take action in on the tube, railways and at airports. They would like to go even further than the Tories' restrictive anti-union laws. From a low level, the first ten months of 2016 saw 100,000 more days lost through strike action than 2015 - a 40% increase. From celebrating the weakness of unions, the press has had to recognise, albeit hysterically, the power of workers when they are organised and prepared to fight. In particular, this was shown by the sight of stations closed across London - including the evacuation of the massive Clapham Junction - because of the effect of the joint RMT/TSSA London Underground station strike on 9 January. Southern Rail accepted that nothing would run when drivers from Aslef and RMT walked out for three days in that long-running dispute. Outrageously, Labour London Mayor Sadiq Kahn has attacked the tube unions for the stoppage. 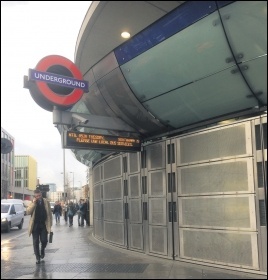 But the strike is against cost-cutting by TfL that has seen over 800 workers lose their jobs in stations with the closure of ticket offices. As predicted by unions, a review by management concluded that this has made the Underground dangerously understaffed. The threat of action has seen them concede 200 new jobs but this is still totally inadequate. As with Southern Rail, workers are taking action to make the transport system safe for themselves to work in and the public to travel on. The Socialist Party welcomes the policy of Jeremy Corbyn to renationalise the privatised rail companies. But he should go further than his proposal that this should happen when each franchise comes up for renewal. They should be immediately taken into public ownership with no compensation for the fat cats who make profits out of rail workers and commuters while still benefitting from public subsidies. However, we support small shareholders being recompensed. This is a crucial time for the rail unions and in particular the RMT. Driver Only Operations is the device of the rail bosses, backed up the Tory government to make cuts and more importantly to seek to attack the strength of one of the most important industrial unions. The industrial and political legacy of the late Bob Crow must be maintained. It is an important thorn in the side of the Tories and an inspiration to the rest of the union movement. Similarly, the strike of the British Airways (BA) cabin crew is vital to defend the position of militant trade unionism at Heathrow in general and particularly in Unite at the airport. The dispute is to improve the low pay of those workers who were employed on an inferior 'mixed fleet' contract in the aftermath of the cabin crew dispute six years ago, despite the willingness of workers to fight management's attacks on jobs and terms and conditions. But while it's true that there are no final victories for workers as long as capitalism remains, there are also no final defeats. This dispute is a real opportunity for Unite to show the new starters that the union is prepared and able to fight for them. As so many workers know, when there are two or more tiers of pay, management will try to equalise to the lowest. Therefore, the union has to aim to get everyone on the original contract, alongside fighting for a big pay rise. The BA strike shows why it is essential that the Unite elections result is a defeat for the right-wing general secretary candidate Gerard Coyne, who would take the union backwards industrially, as well as act against Jeremy Corbyn on behalf of the Blairites. We believe it is a mistake by Ian Allinson to threaten a spilt of the left vote by standing against Len McCluskey. Ian underestimates the challenge of Coyne, who is backed by the capitalist establishment, as last week's Financial Times editorial shows. Ian also tries to minimise the effect that a Coyne victory would have in Unite and the wider union movement. We have made criticisms of Len McCluskey but recognise the advances made under his leadership, which would be threatened if Coyne won. The Tories are now accusing the transport unions of coordinating their action to "inflict maximum pain on commuters". Of course, the unions are taking action to defend themselves and the vast majority of commuters who are workers as well. These and the other disputes that are breaking out can be won, which would give huge confidence to other workers who face similar issues that victories can be achieved. The movement developing against the cuts in the NHS, with a national demonstration on 4 March, also has the potential to win. But unfortunately, as yet action isn't coordinated. But, faced with the massive generalised assault on workers' living standards, jobs and pensions, joint action on a mass scale - posing the idea of a 24-hour general strike - is what is required to face down the bosses and push back their weak and divided government, even get it out of power.